It's a regular occurrence at our place to settle down to a lazy afternoon to a platter of fruit, cheeses and savoury bites. For me, I love vegetable spring rolls or homemade sausage rolls. Mr Steph is more of a chicken tenders or satay chicken kebabs sort of guy. For a little while I was picking up tenders from my local supermarket for him, but I wasn't too impressed with them and decided to create my own. 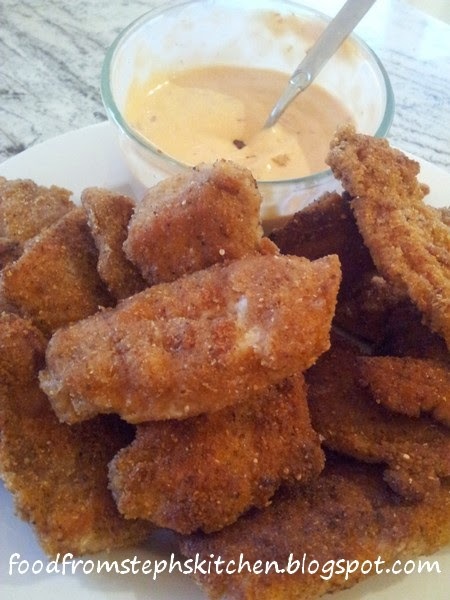 It's all about the spice mix when it comes to tenders. 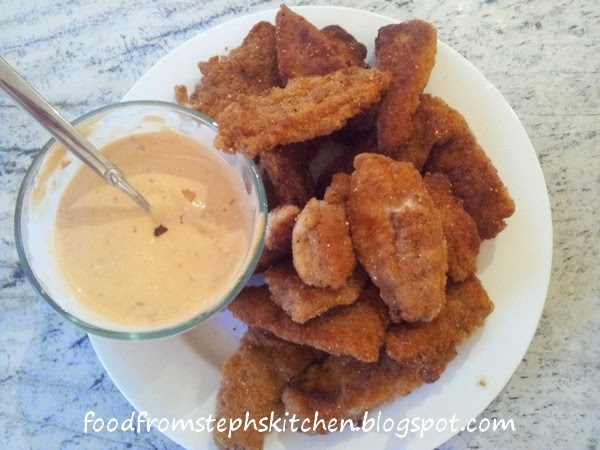 Mr Steph loves tenders more on the spicy side, so I created a blend of paprika and cayenne pepper in my crumb mix. But then, of course, you need a dipping sauce! You could go a simple sweet chilli sauce or a ranch dressing. We find a chilli, lime mayo couples perfectly with them. They are a perfect addition to a nibbles platter, or add them into a wrap with some salad for an easy mid-week meal. 1. 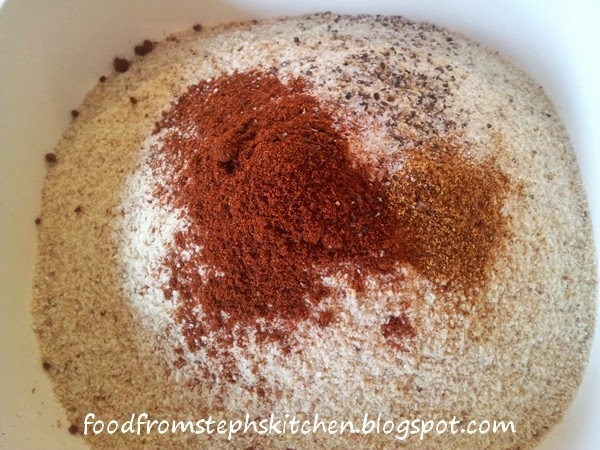 Mix the breadcrumbs, paprika, cayenne pepper, salt and pepper in a medium sized dish. Pour the milk or rice milk into a separate dish creating a bit of a production line for your crumbing. The milk will replace what you may know as an egg wash, which is commonly used for crumbing. Instead of the traditional egg and milk mix, I only use milk as Mr Steph is slightly allergic to eggs. 2. Cut the chicken breasts in half (short-ways), then cut each half into thick-ish strips (at least 1cm). If you have small chicken breasts you might not need to cut them in half first. How you cut them really depends on how long you want your tenders to be. I like to go for shorter tenders, so it's really up to you. 3. To make them nice and cripsy we're going to double crumb the tenders. Yes, it's exactly as it sounds. First, dip the chicken in the milk, then toss it into the breadcrumb mix. To get the best result with the coating, press the chicken into the crumbs - applying a little bit of pressure. This helps the crumbs to stick a little bit better and helps stop you losing crumbs when cooking. Dip the chicken back into the milk, then again into the crumbs. Place aside and continue with the rest of the tenders. 4. Pour in 1cm of vegetable/canola oil into a large flying pan. You could deep fry the tenders or even back them, but I prefer to swallow fry them. Heat the oil on a medium heat (no higher or you'll burn your chicken) until you can hold your hand above the pan and feel that it's hot. Place the tenders in one by one, cooking until the chicken changes colour around the outside then turning. This should give you a nice golden colour. Once golden on both sides, allow the tenders to dry on some paper towel. 5. The chilli, lime mayo is pretty easy to make. Simply mix all your ingredients in a small bowl and you're done. * I buy a jar of crushed chilli at my local supermarket. You can find it in your herbs and spices section, where you'd find your minced garlic. It's great to have in the fridge, and, just like minced garlic, lasts for months. It's very handy to have!